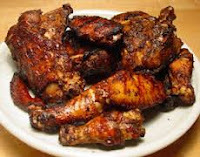 As this is about to be Carnival weekend in London I thought we better have a Jerk Chicken recipe - here it is and it comes with music - now its time to start winin' round your kitchen. And I've heard if you add green onions and one clove of minced garlic with a splash﻿ of dark beer.........you will be rock'in!!!! Eat with fried (festival) dumpling or rice and peas! if you cannot get the jerk chicken seasonings, then buy the two darkest ones you can find.